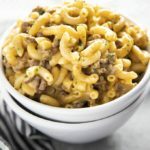 One Pot Homemade Hamburger Helper is just like the classic favorite Cheeseburger Macaroni that we all know and love! This homemade version is made in one pot, rich and cheesy and tastes so much better than the boxed version! Even as an adult I get cravings for those childhood favorites like hamburger helper. 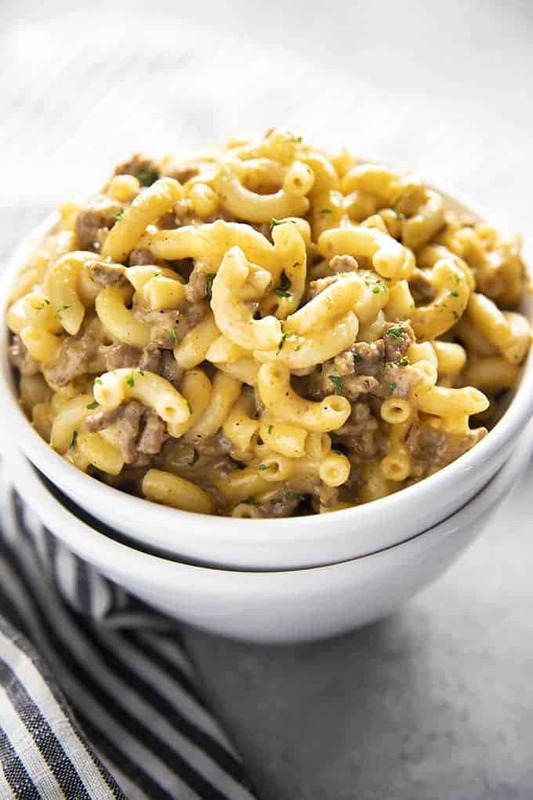 My favorite hamburger helper growing up was cheeseburger macaroni. It’s such a classic flavor combination! Now that I’m grown up I may have the craving, but, the boxed version just doesn’t suit my taste anymore. I love a good one pot recipe too. 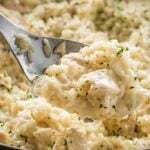 One pot meals like my Homemade Hamburger Helper and this One Pot Creamy Parmesan Chicken and Rice are just as easy to make (if not easier) than any boxed meal. 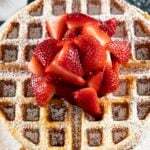 They are super budget friendly and made with ingredients we usually have in our pantry. Plus, they have a really great flavor without packaged powdered products so we know what we are getting! 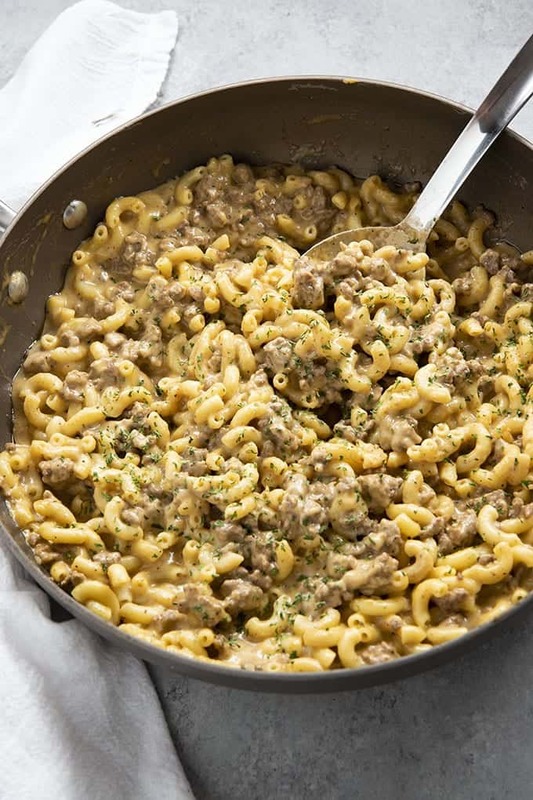 To make this cheeseburger macaroni hamburger helper there is no reason to dirty more than one dish! 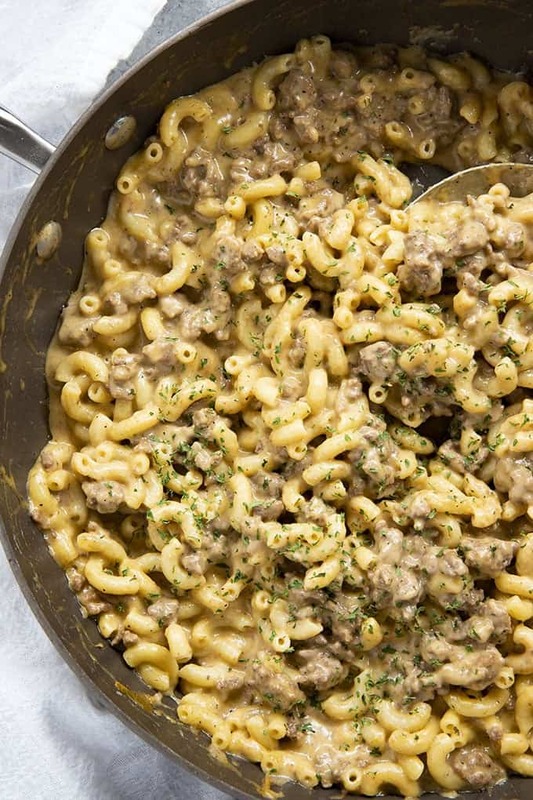 Start with a large skillet and brown your ground beef until it’s no longer pink. Then, drain ALL of the grease from the skillet. I also like to wipe my skillet out with a paper towel for this recipe, although that is completely optional. Next, you will turn your stove heat down to low and stir all of your seasonings into your meat. 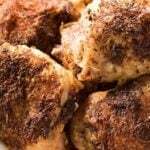 This recipe has been tested and tried many times and the seasoning combo provides just the right amount of flavor without the dish being too salty. Don’t worry about the hot sauce, it doesn’t make the dish spicy, it just adds a nice kick of flavor! The next step is to add your macaroni and beef broth. I recommend using low-sodium broth if possible. 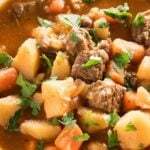 You can also use chicken broth, vegetable broth, or simply water for this recipe if necessary. Give everything a really good stir to make sure the ketchup, mustard, and seasonings are all well mixed in. Use the back of your wooden spoon if you need to make sure the macaroni is submerged under the broth. Then, you will simply cover your dish with a tight-fitting lid and let it simmer for 12-15 minutes until your macaroni is soft. I recommend lifting the lid and stirring once or twice during the process. You will notice that there is absolutely no milk in this recipe. During recipe testing, I found the flavor much better leaving the milk out. 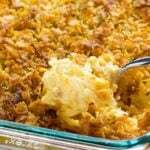 The addition of sour cream at the end gives a great creaminess and zing of flavor! Once your macaroni is completely cooked you will remove your pan from the heat. Then, stir in the sour cream until it is well incorporated. Then, you can place your pan back on the warm burner and add in the shredded cheese mixing until well combined. I recommend using freshly shredded cheddar right off the block if possible. It melts so much better than the bagged pre-shredded stuff! Cook the ground beef in a large skillet over medium high heat until no longer pink. Drain grease and return meat to the pan. 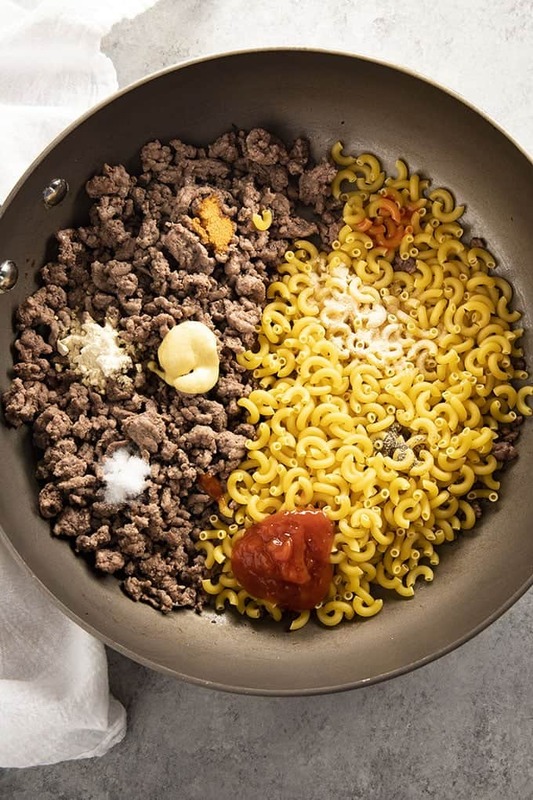 Reduce heat to low and add the ketchup, mustard, hot sauce, seasonings, macaroni and broth to the pan and stir well to combine. Cover and simmer for 12-15 minutes until macaroni is cooked through. Remove pan from heat and stir in the sour cream. Return the pan to the warm burner and stir in the shredded cheese until well combined. 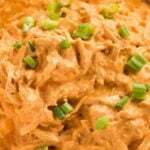 NOTE: This recipe is best when made with freshly shredded cheese. Be sure to follow along with us on Facebook where we share the tastiest recipe videos! I made this tonight and it was a hit – a rarity with picky young kids! Thanks so much for sharing this recipe. I added finely chopped broccoli and this dish is definitely going into the rotation! Hi! What type of hot sauce did you use in yours? And when you do yours do you use just low sodium chicken broth? I have chicken stock already so I’m assuming that will work. Thanks! Hi! I use Cholula almost exclusively lol! It’s my favorite 🙂 . 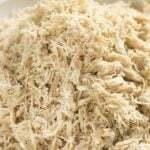 Yes, Chicken stock is just fine!